In Guernsey we are very honoured to have a beautiful South African flower named after us. The Nerine Sarniensis, or the Guernsey Lily (Sarnia is our Roman name). and was the first nerine to be cultivated in Europe, with reports from Paris in 1630. There are a few stories as to how it came to have this name, my favourite that it was washed ashore from the ship wreck of a Dutch bulb trader, and liked the climate. But the truth is nobody knows. But how ever it happened, we are proud of them and every year (and its happening this week) there is a Nerine exhibition at the Victorian Green house at Candie Gardens. It is an amazing display of Nerine, on rainy grey October day, a real blast of colour. but if it is bright pink, then I am sorry its not, that's the nerine bowdenni. A gorgeous watercolour by a local Victorian Artist called W.J.Caparne, which is in the collection at Candie Museum. 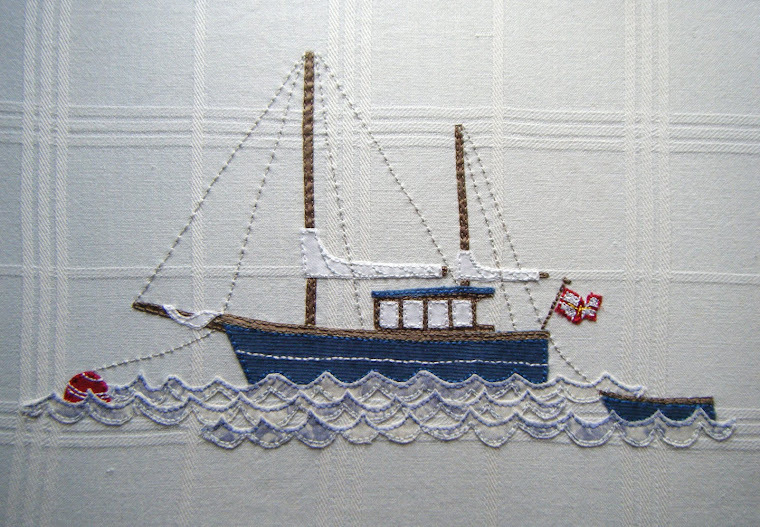 And it features in the guernsey tapestry, and I have the pleasure of being able to look at it every day. its on till the end of next week. Its Offical, Summer has finished!!!! I must finish my blue dress first! and now for the winter baskets!